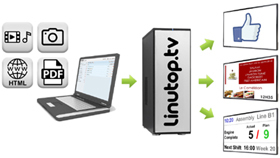 - Broadcast on your screens remotely avoiding moving for updates via a USB key. - Remotely manage the lighting and standby of the screen to optimize its use. - Save a lot of time for a very reasonable price while keeping your existing screens. - Point of sale promotion, broadcast practical information (schedules, weather, exhibiions, menus ...).